Whether you’re planning a campaign for a small start-up or for a college or hospital, you’ll find this book will give you just what you need to guide you through a campaign. Written in a clear and friendly fashion, you’ll find stories and examples that bring the subject to life. But at its heart, this is a practical, hands-on guide that covers the field in its entirety. Expanded Edition — The fourth edition of Capital Campaigns: Strategies That Work has been expanded, updated and reorganized into 19 chapters that provide everything you need to know about capital campaign fundraising. 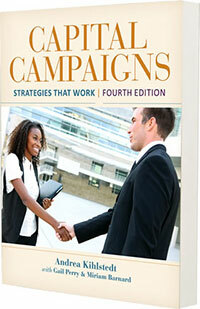 Chapters on pre-campaign readiness and the board’s role in a capital campaign add important new content. A new glossary of common campaign terms and a thorough index will help you find what you need when you need it. 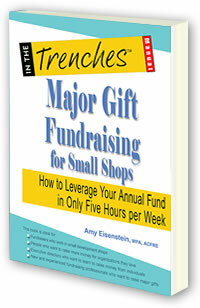 Major Gift Fundraising for Small Shops will guide you, in only five hours a week, to safely and surely meet the challenges of getting your organization ready for major gift fundraising, all the way up to that all-important ask — and beyond.